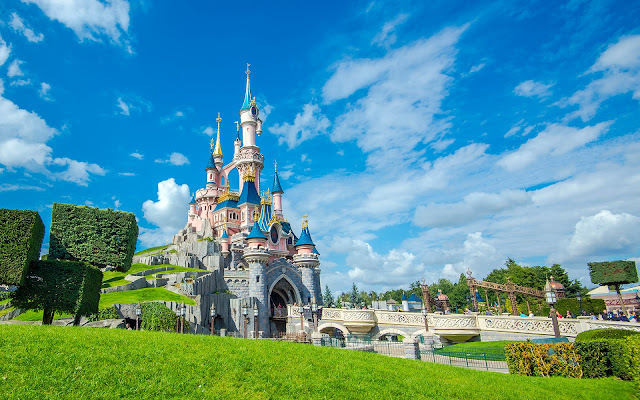 The most beautiful Disney castle in the world is Disneyland Paris' Le Château de la Belle au Bois Dormant, or Sleeping Beauty Castle. With its whimsical spires, terraced hill terrain, and dreamlike architecture, it's quite literally something out of a fantasy storybook. Surrounded by greenery, there are few more spectacularly wonderful scenes in a Disney park, especially on a gorgeously sunny day. Another shot of the gorgeous Sleeping Beauty Castle in Disneyland Paris.